From your initial interview to regular meetings with your Personal Tutor, staff will work with you to carefully consider and plan your progression beyond BHASVIC. BHASVIC offers specialist progression support for Visual Arts students, Oxbridge students, Vets, Dentists, Medics, musicians, those aiming for apprenticeships or direct employment after College, and students applying to foreign universities. Our progression advice and guidance is recognised as outstanding. All students discuss their careers with their Personal Tutor as part of the weekly tutor programme, and students are guided and encouraged in their use of the Careers Suite to find out about higher and further education courses, apprenticeships, employment, careers of interest and gap year projects. We will encourage you to be aspirational and challenge yourself to do the very best you can in your exams and in your future career and life goals. 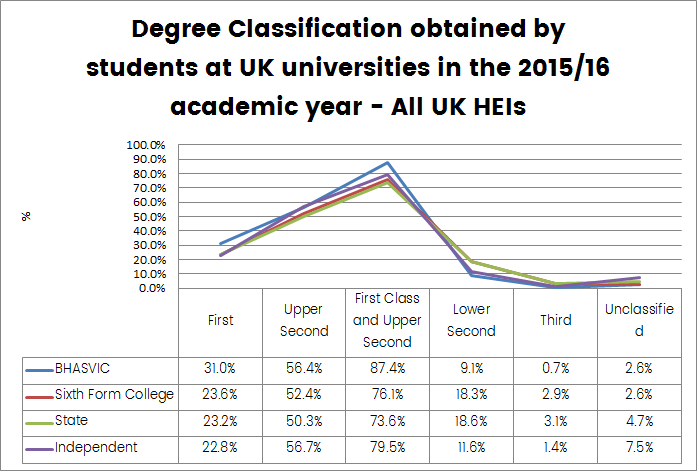 This data, provided to us by the Sixth Form Colleges Association and drawn from the HESA data set, enables us to compare how well BHASVIC students achieve on their degree courses comparable to similar institutions. We can clearly see BHASVIC students achieve higher degrees. The figures show that more than four in every five BHASVIC students who completed a degree achieved a 1st or a 2:1. This percentage is significantly higher than all other sectors, including the independent sector. According to Cambridge University admissions 2016 data, BHASVIC is the third biggest provider of students to Cambridge University with 37 offers from 108 applications. Our conversion rate (applications to offers) is the highest of any non-selective state education provider. *Please note that as many of our A2 students take a gap year and then move into Higher Education the numbers entering HE show in next years figures (see also previous years). In 2016 a higher number than ever % of our A2 cohort (over 75%) made an application to HE. Focus on My Future Plans in A1 tutorial supports students in making informed decisions and explores all progression options available to them, including FE and other forms of education, employment, training and gap years. This summary graph shows the % total of actual acceptances by students into universities. High tariff universities will be requesting the highest grades and will include Russell Group universities and Oxbridge. Total BHASVIC University applicant figures for 2016 have increased substantially from 647 in 2014, to 994 in 2016, of which 211 are ex-students. We have seen a significant increase in the number of students applying to HE to over 75% of the final A2 cohort. 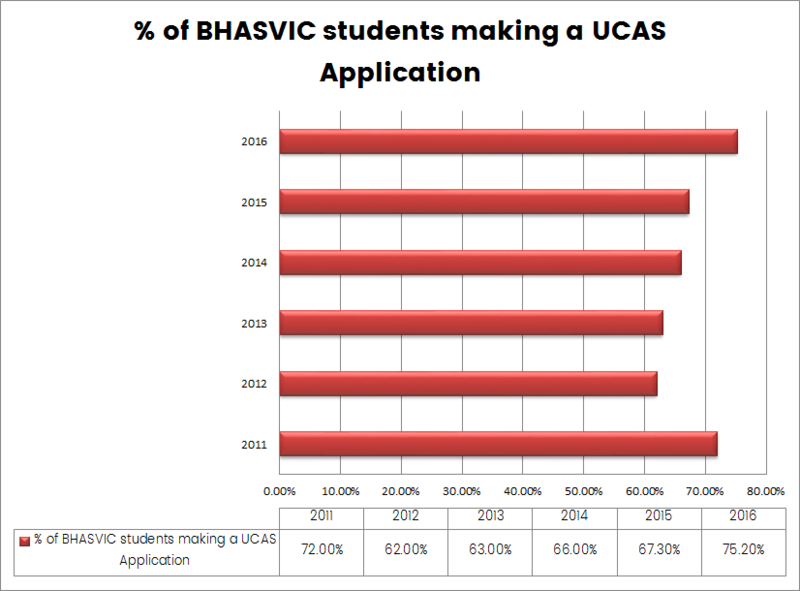 87.4% of BHASVIC students applying to University were successfully placed on a university course, compared with a national figure of 74.5% for post-16 education. 96.8% of our applicants receive offers compared to 87.1% nationally, showing we are successful in guiding students to make appropriate course choices, usually a mix of aspirational, solid and safe. We have seen a large increase in Unconditional offers from 0.9% in 2014 to 10.6% in 2016. 72.2% of BHASVIC students accepted their firm offer – a drop of 10% from last year with an increase in clearing. Our post-results day helpdesk that runs from Results day to the end of August guides to make appropriate choices. Our data shows that our female student acceptance figure is slightly higher than that of our male students, contrary to the national average. We continue to be pleased that our percentage of acceptance routes for all ethnic groups is significantly higher than the national average. 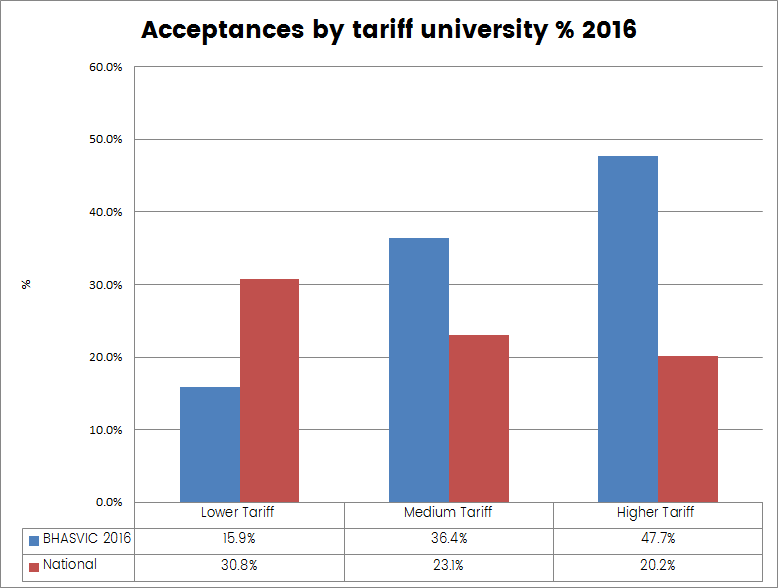 47.7% of BHASVIC students accepted a place at a higher tariff university (to include Oxbridge and Russell Group universities) which is substantially higher than the national average of 20.2%. The most popular subject areas for acceptances are Psychology, History, Law, Maths and Politics. Of note is the increased interest in studying Sociology, Computer Science, Media and combination courses. Our most popular HE providers with BHASVIC students are Sussex, Manchester, Brighton and Bristol. Of note is the increasing popularity of Kent, Leeds, Birmingham and Surrey. Number of Oxbridge offers continues to increase year on year with a large increase in Medics, Veterinary and Dentistry offers from 17 in 2015 to 27 in 2016. HESA data shows that our students are more likely to continue at university compared to the sixth form, state and independent sectors and rates of first and 2:1 degrees are significantly higher – particularly in low participation wards for all UK universities where the figure is 91.8% compared to 69.5 for the state sector. Our internal data shows that our low income students with bursaries and on the deprivation index are more likely to enter HE in the first year compared to our wider cohort, although less likely to take a gap year. 1. BHASVIC student Higher Education academic success remains very strong in the sector and nationally; most recent Higher Education Statistical Agency benchmarking performance for degree students from 2014/15 show the gap widening yet further (positively) between BHASVIC and the Sixth Form College, state and independent sectors. 2. BHASVIC students who are applying to university are very successfully receiving offers from universities and converting offers into places, particularly for high tariff courses. The College is significantly above national trends, indicating the high achievement, well informed choices and reputation of our students amongst Higher Education Institutions. 3. We have improved information to Parents and Carers through HE and Specialist application evenings, website information and documentation. 4. The ‘Is Uni for Me’ and ‘Pathways’ programmes in tutorial have further developed students research and application abilities, with links to employability sectors and apprenticeships. 5. January’s ‘Futures Fair’ was extremely successful in managing over 120 hundred exhibitors from both the HE and Employability/Apprenticeship sectors. A high number of students attended. 6. We have reviewed the Reference, and Predicted Grades deadline with a view to linear qualifications. All teaching staff and tutors attended mandatory training in May 2017 with an added focus on supporting students with Extenuating Personal Circumstances in their applications. Predicted Grades are now able to be set in June rather than September, aiding students in their university research and choices prior to their applications in the autumn. In addition, we have removed the expectation for teaching staff for September updates for references, reducing workload, while retaining flexibility for any late September changes in light of both the remaining AS results and any additional coursework used for assessment. 7. Progression day is now held externally for UCAS students with an opportunity to visit the University of Sussex, experience University life and attend a subject taster lecture of their choice. Additionally Oxbridge, Medics, Employability and Visual Arts students are also receiving a dedicated programme for the day. 8. Continued visits and improved links with Universities continue, with both the HE Co-ordinator and Oxbridge Co-ordinator making focussed university visits. We have also attended appropriate conferences such as the national UCAS conference. 9. We are using a high degree of contact with University of Sussex to improve experiences of HE when choosing destinations, and linking with the University of Brighton, for example the Faculty of Arts will be hosting our Visual Arts section of Progression Day. Both Universities and in also our Cambridge links, the Head of Admissions visited to update our Heads of Faculty, are able to give us useful advice, information and guidance on HE staff queries. 10. BHASVIC is represented on the steering group for the South east hosted by the University of Sussex and also the Sussex Widening Participation groups. 11. We continue to encourage students to sign up for Widening Participation, accessing financial support, Taster days and Summer Schools within the scheme. 12. We have had a recent opportunity to act as consultant for UCAS in development of their improved application process and will continue to do so. 13. Increased applicants to Oxbridge in particular has led to us develop new systems to ensure we are robust in managing expectations, whilst retaining an ‘open door policy’.